It’s dark here. Even though you can’t see, you can feel it; it’s palpable. There are whispers, just on the edge of your perception, and you would swear you’re imagining things — if they weren’t so persistent. You can hear the faint, ragged flutter of the wind somewhere upstairs. A window is open. You tap your cane, and, in a burst of sound, a mental picture of the world around flashes across your mind’s eye (your only good eye) and is gone. Yet, even as you get a handle on where you are, you hear it: from the omnipresent darkness, you hear something coming for you. Something strange. The snippet above is a loose interpretation, but it gives you an idea of the creeping unease that makes up the primary experience of Perception, the new, atmospheric horror release from The Deep End Games. If you’ve not heard of it previously, Perception’s unique take on the genre is to put you in the shoes of a blind woman whose only means of ‘sight’ is echolocation. 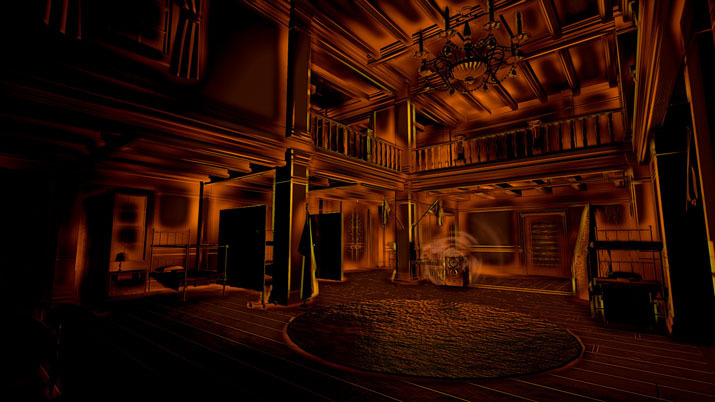 This seems to have provided the devs with a number of unique ways to interact with the player mechanically and even visually, but underscoring it all is the sense of claustrophobia and smallness that being alone in the dark provides. Make no mistake, you’re alone in the dark from the very beginning. Your character, Cassie, has come out of her way to Gloucester, Massachusetts on a journey to discover why this place, and a few seemingly random items in it, have been haunting her dreams. In typical horror fashion, it’s a dark and stormy night [EN: see page 4] when you arrive, and — after fielding a brief call from Cassie’s beaux to help establish character and set the tone — you in the belly of the abandoned house. But, you quickly become aware that you’re not quite alone, there in the dark, and your investigation broadens to include learning the fate of the previous residents. As you busy yourself with the investigation, there are only a few predictable shock scares, and the title is actually more of a walking-sim than a true horror. You navigate from room to room, finding various clippings to scan into text-to-speech with Cassie’s phone, and the odd audio recording. The audio recordings offer a more personal window into the thoughts and sentiments of the previous occupants than the clippings, but both types of clue help paint a picture of the story that unfolded before your arrival, giving you some direction as you explore the house. During this initial calm you have some time to become accustomed to the way Cassie sees and interacts with the world through her echolocation, and, while it’s still fairly dark, you can make liberal use of your walking stick to reveal large portions of your location without consequence and mark important landmarks and objects to memory, whereupon they glow green when you come back to them. However this calm, creepy time inevitably ends and, in a most unsubtle manner, you realize that noise will draw out the specter of the house. Here, the horror element of the game takes deeper root, as your erstwhile freebies with the walking stick must now be measured, lest you draw unwanted attention. The notes and audio logs you find also begin to take a turn towards the disturbing and the macabre around this point, and you begin to see the downward spiral of the family that once lived in the home. For my part, I noticed three things once I entered this stretch of the story: the walking stick is mostly an unnecessary convenience, as merely walking about generates a small area of sight, important objects are usually somewhat noisy anyway, and that, even with the walking stick, it’s pretty easy to lose your way in the house. The house itself is fairly large — more of a manor than a mere house — and maintaining a mental map can be a chore, not least because some events trigger changes in the layout, blocking off some routes and opening up others. You are provided with a ‘sixth sense’ feature in order to grant additional guidance in the dark, but this points you directly at an object without regard to architecture, and so more than once I had a vague direction of where to head, but no real idea how to reach the destination. Then again, the vagueness and uncertainty are somewhat becoming of a nebulous gut instinct, keeping it from detracting too much from the exploration, so your mileage may vary depending on how much hand-holding you desire. She’s fully voice acted, if you choose the Chatty Cassie option before you begin, and often comments on the puzzles and events in the house. One puzzle, in particular, comes to mind, wherein she tells you that something you’ve just encountered will probably open a locked drawer. It does, of course, but I couldn’t help but feel like that level of assistance was a bit much. This small gripe aside, I do recommend having the voice work turned on, as it’s very well done and not overwrought. It brings Cassie’s character to life and helps to give her a sense of wit and determination that would otherwise be absent. The other voice work in Perception you can’t turn off, as it comes with the audio recordings scattered about, but I found all of it to be quality, and it’s clear that The Deep End Games made a point of getting decent voice talent. There are actually a series of pre-recorded messages in Cassie’s phone, too, and so far as I can tell they serve no purpose but to flesh out her character and backstory, and even these, mundane as they are, are delivered naturally. What's more, this voice work (and the audio in general) is well-complemented by Perception’s visuals. When Cassie walks, or uses her walking stick, or encounters some other source of noise, there’s a burst of ephemeral light that coats the world around you in a glowing particulate. This fades quickly with time, with the exception of memorable objects, like doorways and stairs, and this fading-back-to-black enhances the claustrophobic nature of the soundscape and the increasingly desperate nature of the audio logs. It’s almost as if the very act of trying to see poignantly surrounds Cassie — you — with ghosts. On some level, I’m not entirely certain what to feel about Perception. It’s got an interesting narrative thread, though it isn’t ground-breaking. Claustrophobic at times, it’s at once elegant and creepy, but allows its own core mechanic to defang any deeper sense of dread or terror it might have achieved. 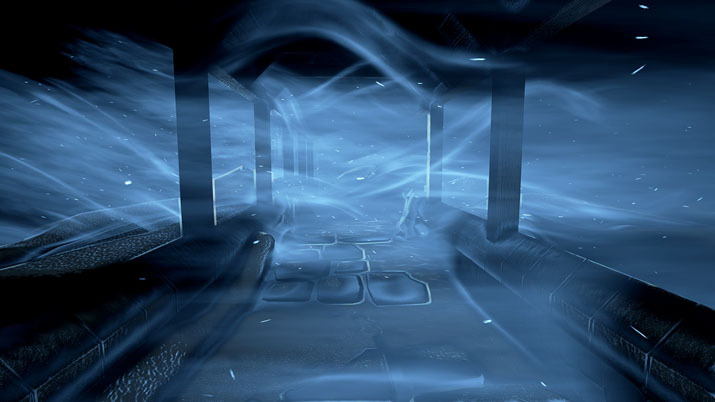 Perception sits comfortably in a casual gray area in terms of puzzles and story, but it offers up some solid voice work and unique, ethereal visuals. Horror fans seeking something novel, though not panic inducing, may find it worth a look.